I been all about the song titles as blog titles eh. Fun fact, I didn’t actually record this on a video phone nor do I really know what that is. Round 3 of finals. Do you think I could go into prowrestling? I like to pretend I’m kinda scary. This morning was my 8am acalc final. The class is normally at two pm, and that is normally the perfect amount of time for my little brain to prepare itself to think of those terms. But the final went okay, it didn’t go as well as my first one (but the class is about about 10X harder…) but it wasn’t as bad as my math class last semester. So I’m pleased for it to be done and for me to be done with it…but more to that later. Tomorrow I have my big coaching portfolio due, but I’m done with that. It was luckily shorter than my teaching portfolio de 50 pages. So tonight will be filled with packing. I was going to do what I eat Wednesday but since I eat the same things-how boring. Fun facts of my day, Justin came over and if you live in my life you know I blog about everything. You must be prepared in all situations and you must agree when I say ohhhh please its for the blog and you’ll be famous. 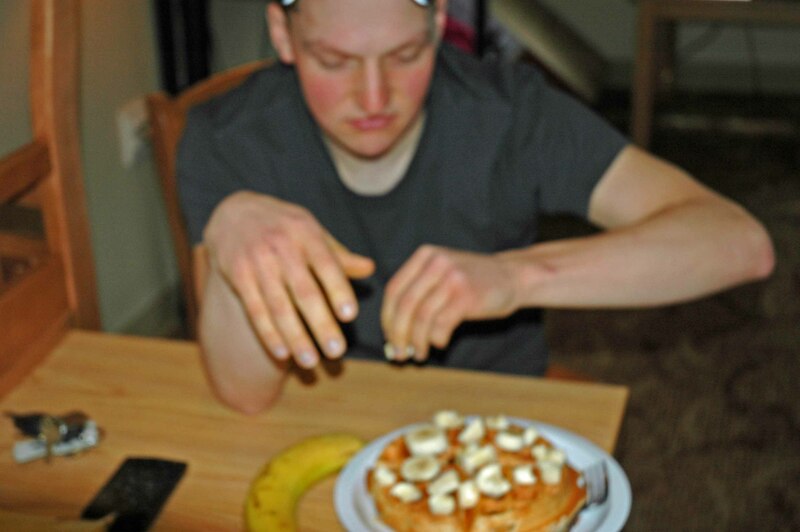 Justin was way too prepared-already making his nanner waffle look the bomb.com. That is why we are Arctrainer besties! He knows how to really fix up for some good food photography. As far as Monday is concerned. You’ll be happy to know that actually the winner of swimming versus running is…. I’m a youtube supahh star!! 1. Do people love/hate your phototaking of food? Do you hide it? I’m so up front with it. I’m like you if you eat with me-you eat with my blogging besties. You think I’m kidding but no. 2. What is a video phone? i loved your vlog!! if anything you will have more followers after it!! good luck on the rest of finals! I love that the gas station has happy hour — that is hilarious! $1 for all that coffee is awesome. Yes I watched your vlog and I’m still a fan! I think you’re pretty awesome. I love the whole bit about the gas station happy hour and you not needing it. I’m pretty sure I’d have said (and done) the same thing! What does “smee” (spelling?) mean exactly? derivation? Haha that vlog was great! I love seeing those because I like to see what people sound like in comparison to what I thought their voices would be like! And congrats on getting that last final DONE! You must feel great to be finished….well almost! Love your vlog! WE NEED TO MEEETTTT so we can be real life biffers, not just blog biffers. 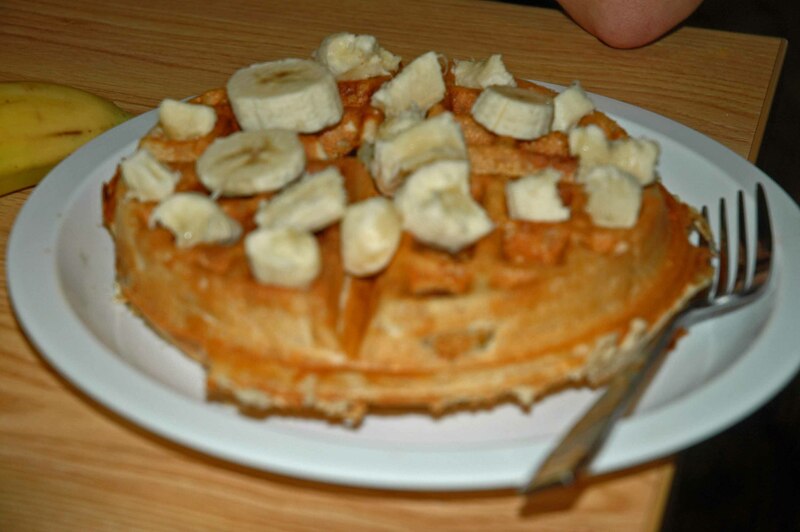 If you go to HLS you’ll be right around the corner from me and we can go running and eat the best pancakes in town. Anyway, you actually sound exactly like I thought you would. I love hearing bloggers voices. I’m jealous that you can get whipped cream in your coffee too.. that’s pretty schnazz. I actually used the word schmee in my head today. I don’t know if it was the right way to use it, but I was in an awkward situation so I just said schmee. It felt appropriate. Oh my gosh that sounds like an awesome final:( Love that you talked about your voice being high…my boyfriend tells me I have a customer service voice and it is much higher and perkier than my normal voice. I worked at a call center and people always thought I was a little girl pranking them until I told them details about their car…lol:) I always get nervous when I’m eating with someone for the first time and warn them that yes-I will be taking pictures! Hahahahaha. LOVE THE VLOG. I want to do one soooo bad! Maybe I should make that my goal this week since I’m no longer working out. Hahaha. Haha nice vlog! Gas station happy hour makes me laugh. I would probably spend $1 on that large coffee too, but I cannot drink coffee in the afternoon or else I won’t sleep well at all. I love me some morning coffee! Loved the vlog. You are so funny! Crush the finals girl! Bet you’ve already crushed the first two! And you haven’t done that awful treadmill run have you? Haha totally caught the British accent when you said “Auuhbviously” Love it!! Haha nice v-log 😉 Your funny! Yay – congrats on getting that calc final out of the way! I don’t get self-conscious taking pics of what I eat so much as taking pics or having pics taken of myself. When I went on vacation with my dad and was constantly taking pics of every little thing for my blog, he told me that he thought I was a spy! You are too frickin cute! love you! ya know, I LOVE foot, and I LOVE eating, but i sometimes get tired of taking pictures of my food. waah. and thank you for not ruining ANTM for me. 😉 i owe ya one. AH your voice is so awesome. You have a wonderful accent in it and I was like “where is she from again?” I wish we could be bffs in real life so I could be blessed with hearing you all the time. Maybe I should do a vlog sometime soon. I have no idea what I would talk about though!! P.S. You are so darn smart. Can I have your brains please?! Loved the vlog haha. The calc final sounds like hell tho yuck coffee is def deserved after that. I could never do an open water swim. Though I’d love to get over my ridiculous fear of sharks and do the Maui open water swim someday. You swim from Maui to one of the other islands (Molokai maybe?!) and it’s a huge event, and always around my birthday. But like I said. I’m a wimp. Sharks are no joke.